but there is a simple rule to follow. If anyone uses the word gourmet then undoubtedly what they are trying to sell you is not. 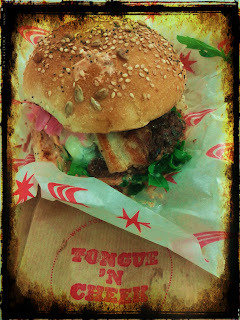 What better place than London then, for the burger to go from being a Pauper to a Prince. A London where new fads are welcomed as often as Big Ben chimes. A London where groups and 'secret' events will be set up for the sole purpose of discussing with irritating seriousness, the most recent craze. A London where uniqueness is championed, then copied until it is no longer unique and as a result is deemed commercial and as a result becomes undesirable. This is the London where the burger can climb to new heights. With the recent surge in the popularity of street food in London, this has allowed the burger to take centre stage. Each burger stall that has popped up has their own take on what they consider to be the finest burger, none more so than Tongue n Cheek. They are an Italian food inspired street trader who are championing the lesser used cuts of meat such as ox tongue, ox heart and pig cheeks. Their speciality is the heart breaker burger, named as such due to the combination of ox heart and 60 day aged beef. The heart breaker really is a very meaty burger thanks mainly to the top quality beef - supplied by Nath the butcher from the Butchery Ltd - but also because the inspired choice to add ox heart gives it a much fuller flavour. The burger comes in three forms, original with cheese, the chimicurri, which I have yet to try mainly because I can't help but order the 3rd burger, the belly connection. They also do a porky sub -slow cooked pig cheeks in a port reduction served with coleslaw. Its good but not a patch on the burgers. The cheesy is what we all expect of a classic burger, cheese, lettuce and pickles mustard and ketchup. An excellent burger for £5. To be honest if this was the only burger they did I would be very content. The burgers meaty and juicy, really juicy, messy juicy but in a good, mop up the juices later way. The cheese is cheesy, its cheddar so you can't go wrong. All in all an exceptional burger, I would say you'll have to go a long way to find a better burger, but you don't. All you have to do is allow your eyes to drift a little to the right on the menu to spot the Belly connection. This is a game changer of a burger. Pimento mayo, pickled red onion, rocket, the meaty juicy heart breaker burger, Gorgonzola, and to top it all off a couple of slices of fried belly pork. Good lord its good, dangerously addictive good. Its so moreish you would think it should be illegal. All for £6.50. That is cheap for what is effectively Class A food. One little gripe, I would like a better bun to house the burger. A nice bread roll verging on the sweetness of brioche that has been given the privilege of a long slow fermentation would probably make this the best burger in the world, for now though, it is the best burger in London.